These essays offer ministers of the Church -- priests, religious, and laity -- the most up-to-date liturgical scholarship so that they may look ahead to the needs of their assemblies. - Publisher The underlying premise of this study is captured in the first verse of Psalm 24, which states that "the earth is the Lord's" and no one else's. This is a major theological tenent that undergirds the biblical tadition. Insights from contemporary science prompt us to look anew at our understanding of the natural balance within the universe and aat humankind as manifestation of life within that universe. Theology calls us to reexamine the role that worship plays in our acknowledgement of these realities. 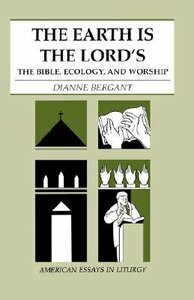 After a discussion of some scientific principles, the book examines several biblical themes in order to discover how they might help to fashion a liturgical perspective that is faithful to biblical faith and contemporary in its eco-sensitivity. About "The Earth is the Lord's"
The underlying premise of this study is captured in the first verse of Psalm 24, which states that "the earth is the Lord's" and no one else's. This is a major theological tenent that undergirds the biblical tadition. Insights from contemporary science prompt us to look anew at our understanding of the natural balance within the universe and aat humankind as manifestation of life within that universe. Theology calls us to reexamine the role that worship plays in our acknowledgement of these realities. After a discussion of some scientific principles, the book examines several biblical themes in order to discover how they might help to fashion a liturgical perspective that is faithful to biblical faith and contemporary in its eco-sensitivity. Dianne Bergant, CSA, PhD, is professor of Old Testament studies at Catholic Theological Union in Chicago. She has published numerous works, including Song of Songs in the Berit Olam series and Preaching the New Lectionary, both published by Liturgical Press.